Lakeland is a city of rich history and an up-and-coming future. Strategically located at the heart of Florida’s High Tech Corridor, Florida Polytechnic University is within 60 miles of more than 11,000 technology and engineering firms. That’s more than 70% of Florida’s high tech industry. It’s also halfway between Tampa and Orlando, which makes the region’s theme parks weekend destinations. With the downtown commanding stunning views of city lakes, Lakeland has the gentility of a Southern city and the vibe of an urban lifestyle. It’s a convenient and affordable place to live, close to the campuses of the University of Central Florida and Florida Southern College, which makes it easy to meet other young adults with similar interests. Baseball is a favorite pastime for Lakeland residents. In 1966, the city of Lakeland established Joker Marchant Stadium as the official Spring Training facility for the Detroit Tigers. During the spring months, the stadium attracts thousands of people to watch the Tigers play other Major League Baseball teams, including the Boston Red Sox and New York Yankees. The year 2016 marks the Tiger’s 80th spring season in Lakeland. GPS Location: Joker Marchant Stadium is less than 10 miles from Florida Polytechnic University. Lakeland is known as an international hub for aeronautical education. It’s home to the Florida Air Museum and the nonprofit, aviation-centered organization called Sun n’ Fun. Each year, Sun n’ Fun hosts one of the nation’s largest airshows and fly-ins. The event features some of the nation’s most well-known vintage and experimental aircraft and performances from the U.S. Navy Blue Angels and U.S. Air Force Thunderbirds. GPS location: Sun n’ Fun is located less than 25 miles from Florida Polytechnic University at the Lakeland Linder Regional Airport. Lakeland is conveniently located along Interstate 4, Florida’s 132-mile-long highway that links the state’s east and west coasts. To the east is the city of Orlando, known for its international tourist attractions, world-famous resorts and dining, premier shopping and entertainment venues. Orlando is home to the Orlando Magic of the NBA and newly established Orlando City Soccer Club. Aside from its popular nightlife and entertainment, Orlando is also known for its theme park attractions, including Walt Disney World, Universal Studios, Islands of Adventure and Sea World. Lakeland is often referred to as a suburb of Tampa, which is located a little more than 35 miles to the west. Tampa offers an array of entertainment venues including its amphitheater, the Hard Rock Hotel and Casino, Busch Gardens, Raymond James Stadium and Amalie Arena. Each serves as a popular forum for nightlife or sporting events for teams such as the Tampa Bay Lightning and the Tampa Bay Buccaneers. Tampa is in close proximity to St. Pete Beach and St. Petersburg, home to the Tampa Bay Rays. Additionally, Ybor City and the Channelside district are popular locations for dining and socializing. GPS location: Both Orlando and Tampa are located within an hour from Lakeland and make excellent day trips and weekend getaway destinations. Craving a little beach time? Some of Florida’s best beaches are located within an hour’s drive of Lakeland. Whether you prefer the calm, warm waters and white sandy beaches of the Gulf of Mexico, or surfing the waves of the Atlantic, you’re never far from a day in paradise. In addition, Lakeland offers plenty of water-based activities, including fresh-water fishing, skiing, airboat rides and kayaking around its many lakes and connected waterways. GPS location: Lakeland is a little over an hour from west coast beaches, St. Petersburg and Clearwater. It’s under two hours from Daytona Beach, voted among the top ten most popular spring break destinations in 2015 by U.S. News and World Report Travel. These companies work closely with students attending Florida Poly, offering internships, research opportunities and career placement in the STEM fields. GPS location: Department of Citrus, Publix Super Markets, Lakeland Regional Medical Center and Mosaic (established just south of Lakeland) are located about within miles from Florida Polytechnic University. Love the outdoors? Lakeland is known for its numerous lakes, waterways, nature reserves and recreational parks. Lake Parker Park and Loyce E. Harpe Park are outdoor hotspots, offering numerous sports complexes and bike trails. Boating, paddleboarding and kayaking are also popular at these sites and at Lake Hollingsworth and Banana Lake. Lakeland is also home to Circle B Bar Reserve, voted among the top 51 Great Places to See Wildlife by USA Today Travel. This reserve is recognized for its various wildlife ecosystems, as well as its hiking, horseback riding, picnicking and wildlife observation. GPS location: Each of these parks is located less than 23 miles from Florida Polytechnic University. Lakeland is a city that thrives on history and community involvement. Along its Main Street and intersecting roads, Lakeland is comprised of well-known restaurants, local shops, historic venues and coffee house hotspots. Every month, Downtown Lakeland hosts its First Friday event, showcasing free entertainment, live music and activities from local establishments. The downtown area also hosts a weekly Farmers Curb Market, offering organically grown groceries, freshly ground coffee and tea, retail and food from local venues. Each May, the city of Lakeland invites the public to Mayfaire. The fair, which is traditionally held on Mother’s Day weekend, has grown into one of Florida’s top outdoor art festivals. Mayfaire showcases traditional and eclectic art of all kinds, in addition to live entertainment, a fireworks show and a 5k walk/run. Aside from its annual events, the city of Lakeland hosts many other community activities, partnering with the historic Polk Theater, the botanical Hollis Garden and the Lakeland Center. It also maintains a presence in the arts, proudly serving as the home of the Polk Museum of Art. But great works of art are not just museum pieces in Lakeland. 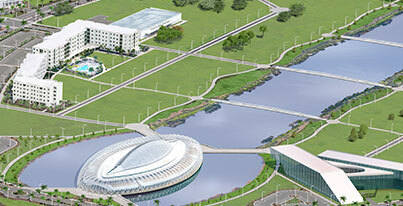 Just take a look at the Florida Poly campus and its landmark Innovation, Science & Technology Building (IST). This structure is the primary classroom building and hub of all campus activity. But the ultra-modern IST also is the masterwork of world-famous architect Dr. Santiago Calatrava, known for his sweeping works that are artistic creations in their own right. Schedule a guided tour of Florida Poly’s technology rich campus and modern learning environment. The opportunities and amenities found in Lakeland mirror any big city but definitely have that small town feel. Lakeland offers incredible internship and networking experiences for Florida Poly students, with future employers just a short drive away. And, Lakeland’s prime location allows students to experience life as a Floridian in an accessible and affordable way. There are also many free things to do – biking, kayaking and skateboarding to name just a few. Want to spend a day at the beach? Visit a renowned theme park? Or attend a popular sporting event? Lakeland’s got students covered.